The Staples Center in Los Angeles, California was the host site for tonight’s Showtime World Championship Boxing card. Al Haymon’s Premier Boxing Champions was the lead promoter for the card. Three bouts were broadcast on tonight’s card, including a main event between Mikey Garcia and Robert Easter Jr. for the WBC/IBF Lightweight Titles. The first televised fight of the night was between Mario Barrios (21-0) and Jose Roman (24-2-1) in the junior welterweight division. Barrios was the bigger boxer of the two and came out the more active fighter. Barrios got a cut by his left eye in the opening round from a punch. Barrios landed some solid body shots in the second round and was walking Roman down. Barrios landed a good right to the body left hook to the temple combination. By the third round, Barrios landed twenty body shots in comparison to the three body shots that Roman had landed. Roman went down in the fourth round after getting stung with a straight right hand and a hard left hook upstairs. Roman closed the round strong in the fourth. Barrios continued to chase Roman down in the fifth round while Roman tried to circle away. Barrios continued the barrage into the sixth and seventh rounds and his left hooks were landing well. Barrios continued to obliterate Roman in the eighth round and forced Roman’s corner to stop the fight. Mario Barrios remains undefeated with an 8th round TKO. The next bout of the night was a heavyweight fight between Luis Ortiz (28-1) and Razvan Cojanu (16-3). Cojanu towered over Ortiz with a huge height advantage. Ortiz, a southpaw, was walking down Cojanu with a steady diet of jabs. Ortiz was able to land a few lead left hooks that seemed to stun Cojanu. Ortiz had a stiff jab in the second round and continued to back Cojanu up. Ortiz was able to land a hard straight left hand to the chin of Cojanu that sent him falling to the mat face forward. He attempted to get up but stumbled several times and forced the referee to stop the fight. Luis Ortiz wins by knockout in the third round. The main event of the evening was between Mikey Garcia (38-0) vs. Robert Easter Jr. (21-0) for the WBC/IBF Lightweight Titles. Easter looked significantly taller than Garcia and used his lengthy jab to keep Garcia at bay in the opening round. Garcia appeared to start to find his range at the end of the first, but Easter had thrown the higher number of punches. Easter threw straight right hands to the body and was able to land his left hooks to the head. Garcia was able to momentarily trap Easter in the second and land some combinations by the ropes. Easter closed the second with some sharp jabs to the head. Easter pressed the pace early in the third round but Garcia was able to slow Easter with his jab and left hook. He pressed Easter until he landed a right cross left hook combination that sent Easter down. Garcia ended the round with Easter on full retreat. Easter with active with his jab in the fourth round. Garcia was able to sneek a right hook around the guard of Easter and was sharp with his lead left hook. 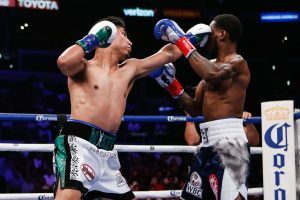 Garcia continued to land the heavier shots in the fifth and sixth rounds and was landing a consistent jab. Garcia had a dominant seventh round and was landing heavy shots at will. Easter was doing his best to circle away from Garcia ‘s power in the eighth round but often got tagged. The ninth round featured several good violent exchanges, but Garcia appeared to be landing the more damaging punches. Garcia had Easter trapped several times in the tenth and eleventh rounds and took advantage by landing heavy shots, but wasn’t able to send him to the mat. Garcia was comfortably ahead in the final round but still tried to get the stoppage victory. Easter fought valiantly, but wasn’t good enough to beat Garcia. Mikey Garcia wins with scores of 116-111, 117-110, and 118-109.